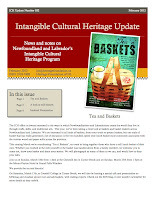 In this month's edition of the Intangible Cultural Heritage Update for Newfoundland and Labrador, we invite people to our "Tea and Baskets" events in Corner Brook and Grand Falls-Windsor; ICH intern Nicole Penney shares some of her research on mill lunch baskets; and we nominate inukshuk building as an item of provincial historical significance. Download the newsletter in pdf form. I have been corresponding a bit lately with Misako Ohnuki, Deputy Director of the International Research Centre for ICH in the Asia-Pacific Region (IRCI) based in Osaka, Japan. Curious about the work we are doing in Newfoundland and Labrador, she asked me about some of the difficulties and hurdles that we have have faced so far in documenting intangible cultural heritage (ICH) in communities in this province. Read my short report on "Challenges in the community conservation of Intangible Cultural Heritage in Newfoundland and Labrador." 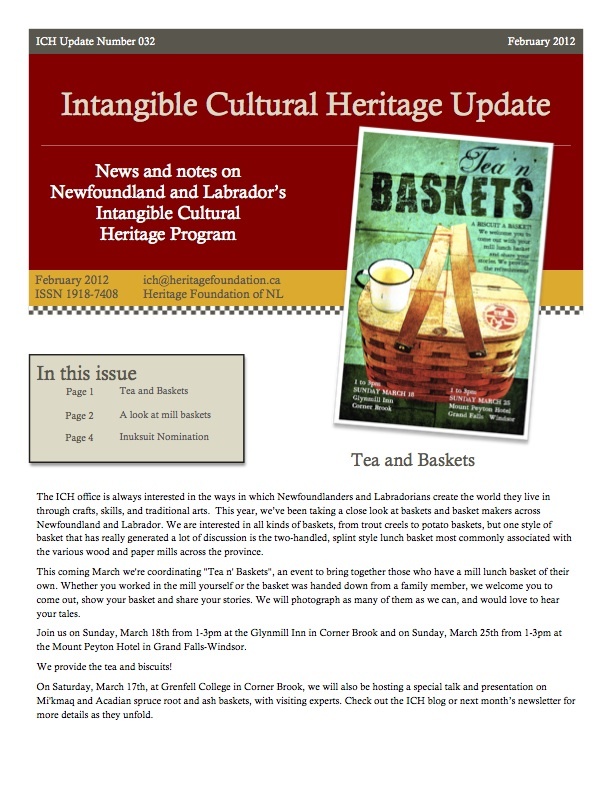 And finally, Memorial University has published an article about our current Public Folklore Intern Nicole Penney's work placement with Heritage Foundation of Newfoundland and Labrador and her work cataloguing baskets and baskets makers in Newfoundland.